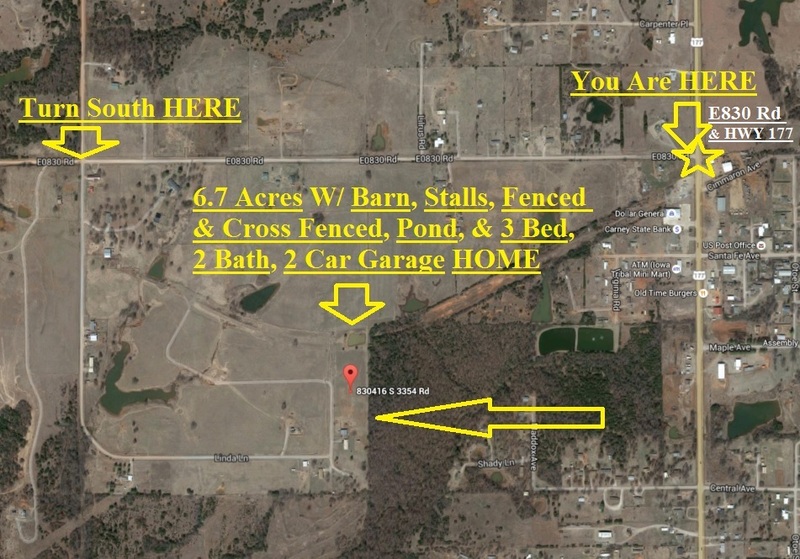 Call 405-315-7965 to See Your New Home * Official Virtual Tour: https://youtu.be/85LBducwj38 * Beautiful 6.7 Acres located on a Dead End Road * Your New Horse / Recreational / Homestead / Farm Property Features A Manicured Pasture, A Wonderful Pond w/ Fishing Peninsula, A Horse / Farm Barn that Offers 6 Stalls Inside & an Awning, A Round Pen for Working Horses, 4 Separate Cross Fenced Sections in & around the Barn for All Your Livestock / Working Needs, & Amazing Foaling Shed or Extra Stall. The 1,472 sqft Home, Built 1986, Provides 3 Amazing Bedrooms w/ Built-ins in all the closets, 2 Custom Bathrooms w/ Oversized Medicine Cabinets & custom tile work. The formal dining offers enough room for 2 hutches & a 12 person table. The Open Living Room w/ Painted Decorative Beams Provides the Charm that all Your Guests will be Jealous of. The Kitchen Offers a 50 / 50 Sink, new plumbing, & Faucet, Breakfast Bar, & Custom Cabinets Throughout. Enjoy Playing Cards while talking the night away, watching the Sunset in the background on your Covered Front Patio, and enjoying the last rays of light shine through your seedless walnut tree. There is not a more Perfect Country Property just 12 minutes from the Turn Pike & just 40 Minutes Outside the City. Your New Home Provides the Escape from the City that You Desire. This is Your Private Farm / Homestead that you’ve been looking for.